The production of these grooved rubber-coated spreading rollers, which serve to draw apart spreadmaterials from the centre to the sides, is carried outby Asociace gumárenské technologie Zlín s.r.o., based in the Czech Republic. 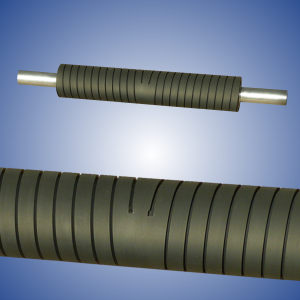 Rubberised rubber rollers are an integral part of all conveyors, winding and other industrial machines. Grooved rubber-coatedspreading rollers serve to spread materialout from the centre of the roller, which prevents the material from rumpling, with no wrinkles occurring. Asociace gumárenské technologie Zlín s.r.o. performs rubber-coating of the rollers and subsequent cutting of the grooves of the left and right screw symmetrically from the centre of the roller. These grooves spread the conveyed material from the centre to the sides so that the material does not get wrinkled. The rollers also prevent any wrinkles or folds from occurring. They can thus serve to stretch and smooth out the material. Grooves are cut using NC machine tools and the number of grooves and their angles are completely customisable. The advantage of grooved rollers is that the rollers themselves are not glued together; rather, the groove is cut directly into the vulcanised rubber itself. We produce rubberised rollers according to customer requirements.